There are two cocktails which are irrevocably identified with Venice: the Spritz and the Bellini. The Bellini was born in Venice’s most famous watering hole: Harry’s Bar. Owner and barkeep, Giuseppe Cipriani, created his bubbly celebration-in-a-glass in the 1930s. When he reopened his bar after World War II, he resurrected the cocktail and christened it “the Bellini” in honor of Giovanni Bellini, one of Renaissance Venice’ finest painters. That Cipriani named his smooth and elegant cocktail for Bellini is particularly appropriate. 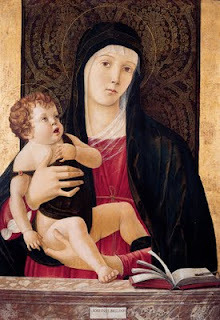 Giovanni Bellini (c. 1420 -1516) shaped Venetian painting, bringing the best of Florentine technique to Venice while still maintaining the smooth sensuality that distinguishes Venetian painters from other Italians. 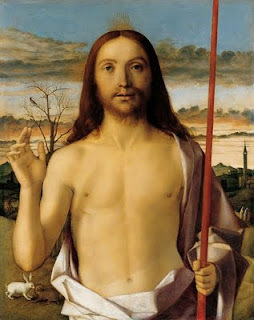 His work doesn’t have the raw sexiness that would define Titian, his student. But his figures are soft, fleshy, and strikingly human. So, how do you pour all of that into a glass? Harry’s Bar and its cousin, Venice's luxurious Hotel Cipriani, start with the flesh of white peaches (not yellow). Fresh peaches are best, but their season is short, so frozen peaches can be used, too. The peach flesh is grated or blended on a very low speed until it is a thick puree. The charming bartender at the Hotel Cipriani admonished me not to incorporate too much air into the puree -- it interferes with the bubbles, and we certainly don’t want that! If the peaches aren’t sweet enough, stir in simple syrup to taste. But a Bellini is never sickeningly sweet (and it is never, ever made with candy-flavored schnapps). Fill a cold champagne flute 3/4 full of peach puree and top with Prosecco, Venice’s sparkling wine. Prosecco is sweet, bubbly, and refreshing. Read more about Prosecco here. A hint: all of the ingredients should be cold, cold, cold! The Bellini cocktail tastes the way a Bellini painting looks -- deceptively simple, clear and refreshing. It is bubbly and full of life -- like biting into that perfect, juicy peach. Perfection! 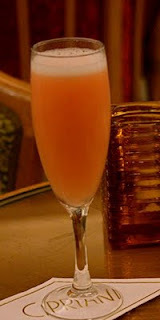 Any of the hotel’s restaurants or bars will supply a perfect Bellini. I enjoyed one in the landmark Gabbiano Bar while being serenaded by the pianist. 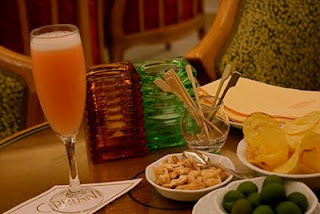 Note: I enjoyed a Bellini while staying at the Hotel Cipriani. My stay was sponsored by Hotel Cipriani and KiwiCollection.com. Read more about my review policies. I think you know how much I love this drink. Thanks for the recipe, although I really think part of what makes it taste good is drinking it in Venice. Thanks for sharing the recipe. I definitely agree. What was made in Venice should only be tasted in Venice. I'd be sure to keep that in mind on my next travel. YUM!!! i love peaches. love the story! Harry's Bar in Venice!! Nothing to compare with Harry's Bar in Paris, which is a simple, not too expensive one (but still famous and inventor of the Bloody Mary).